Given its specialist materials and the stunning results often seen in fine ecclesiastical embroideries, goldwork is often mistaken for a difficult art. In fact, it can be picked up and enjoyed quite easily. The great thing about sparkling, eyecatching metallic embroidery is that there's no need to be an instant expert in order to achieve show-stopping results. There's more. The expense that you might associate with the practice is not necessarily an issue. 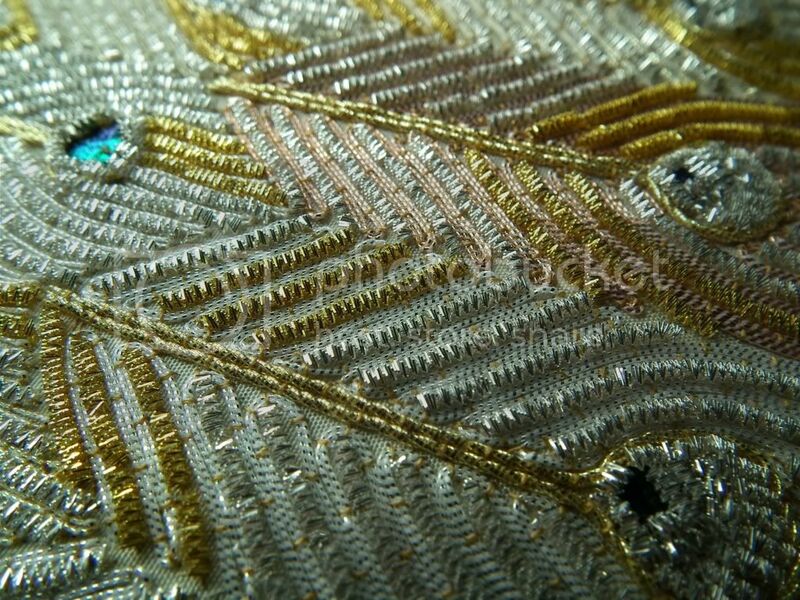 Costs can be kept under control by using a small amount of goldwork to accentuate an otherwise silk embroidered piece, and gold- or silver-plated wires are an economical alternative to the purer metallic threads also available. Gold for embroidery has never, in fact, been pure gold: gold wires are composed of a core of cheaper metals (traditionally silver) coated in gold, and gold threads are wound around a silk core. Even the richest available are only, in fact, 2% real gold. Man’s court ensemble of red wool coat and cloth-of-silver vest, Italy, circa 1800. The coat and vest are decorated with silver metallic-thread embroidery in a pattern of stylized leaves, oak leaves and acorns, worked in satin stitch directly on the cloth. LACMA public domain imageGoldwork is said to have originated in Asia as much as two thousand years ago; several references to the use of gold threads can be found in the Bible. In India, the craft followed sultanate conquerors down the mountain passes of the Khyber onto the plains of the Indian subcontinent by the twelfth century. Fabrics ornamented with gold naturally suggest regal opulence, symbolising wealth and power (and even perfection) in any context, not only in their appearance but in their usage: since clothing embellished with metallic threads and wires cannot be cleaned safely in any way, clothes embroidered in this way have always been reserved for the most special occasions by necessity alone. These expensive clothes - not to mention many other items such as saddles, tents, and smaller items sewn with gold, silver and/or copper - were not only popular with royalty and nobility in early times, but also as gifts among the elite, causing its popularity to spread naturally. Trade overseas is recorded from around the fifteenth century, particularly through Portuguese merchants, and especially after the secrets of silk production leaked out of China, making gold-wrapped silk thread more widely available in the West. After the birth of Christ, embroidery in gold, silver and copper began to appear on vestments and clothing across the Mediterranean and into Europe. Heraldic devices of the Middle Ages required liberal silk and metallic embroidery, and the same era saw the greatest period of religious embroidery. Opus Anglicanum, or "English work", was of a quality that brought orders from as far afield as the Vatican. The Elizabethan era saw goldwork incorporated into domestic embroideries, on smaller items of blackwork or silk embroidery, and then extensively over eighteenth-century costume, particularly in court fashions such as ornate gentlemen's frock coats. It is seen even up to the present day in uniforms and livery. Moving further towards the present day, goldwork saw a revival in the twentieth century in smaller, artistic embroideries. The Royal School of Needlework calls goldwork "a very exciting and underused technique," and I hope I can convince you to give it a try. Goldwork is undertaken with threads and/or wires, in gold, silver, copper or a variety of metallic colours. Generally speaking, threads are laid on the surface of the fabric and sewn ("couched") down. 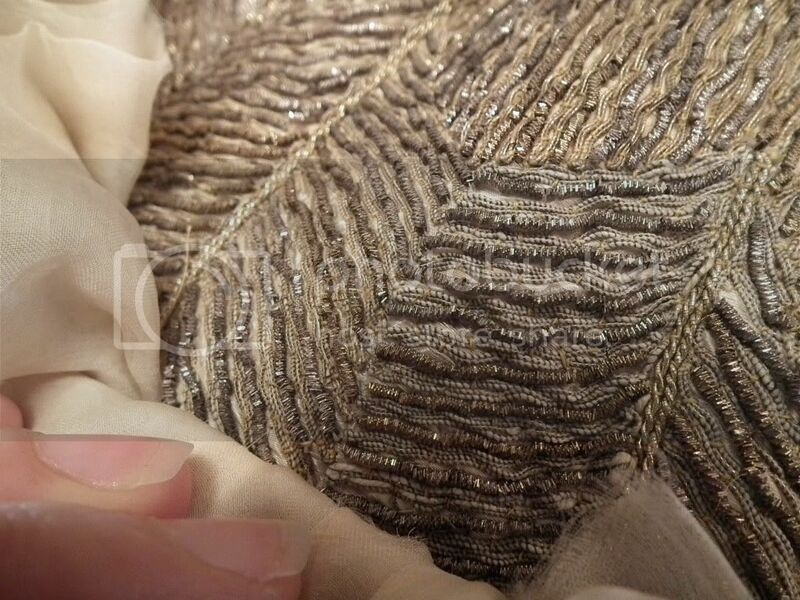 Stunning effects can be produced not only by varying the metallic threads, but also by varying the colours of the threads used to couch, and/or the patterns or density of the couching stitches. Here's a great example of imaginative use of the couching threads to depict a red rose. Wires, meanwhile, are literally a fine metallic wire wound into a tight coil, which you can cut into little pieces and sew down like a bead. Below is a video of gold wire being wound into "bright check purl" at the factory of Benton and Johnson, who have been making goldwork materials in the UK since the eighteenth century. The wire comes off a spool at the top of the machine and runs down to wind around a thick, multi-faceted needle, which is turned by a motor. The wire thus wound snakes off the needle towards the operator and is collected in a groove beneath. Embroidery needles and silk thread are needed to sew the gold materials down. I prefer a fine brand of thread that won't get caught on protruding bits of wire - I found Coats' "Seta Reale" preferable to Gutermann silk thread. It can be found on Ebay, or even Amazon. A chenille needle is a large eye needle much like a tapestry needle, but it has a sharp point. It is useful for pulling the ends of finer goldwork threads through the fabric for a neat finish. Goldwork scissors are the same size as regular embroidery scissors, but are finely serrated to help with cutting wire. A Mellor is an optional but helpful tool that helps you to hold threads flat on the fabric. Tweezers will help you to squeeze threads to a sharp point when turning corners. A velvet board is simply a piece of cardboard about 15cm (6") square, covered in a scrap of velvet (make your own!) Cutting the wires on this board will be easier than on a flat table surface or saucer, since the velvet will stop the pieces jumping or rolling around. By 1902, the craft of goldwork was in danger of decline in India, and so Lord and Lady Curzon, the British king's representatives as Viceroy and Vicereine of India, chose to patronise traditional local crafts in celebrating the spectacular Delhi Durbar to mark Edward VII's coronation. 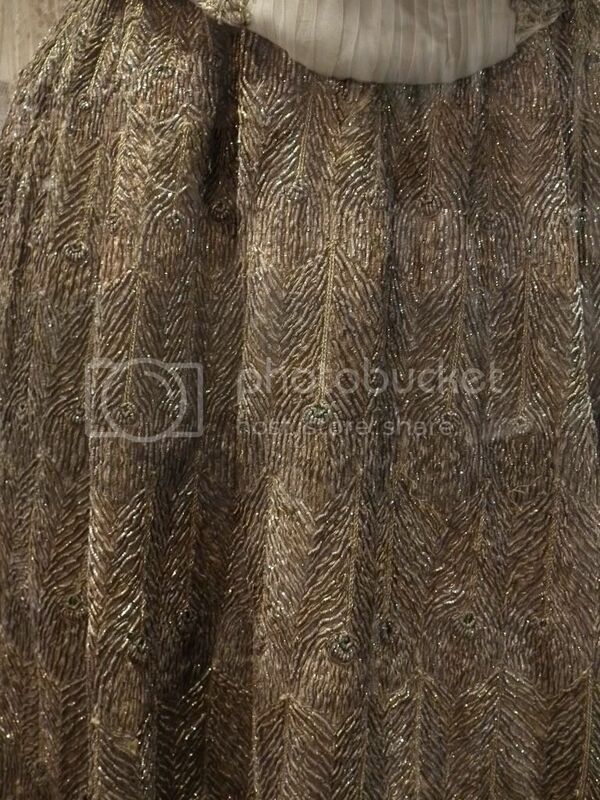 Lady Curzon famously wore an extraordinary goldwork "Peacock" dress at the Coronation Ball during the celebrations, which was completely embroidered across its entire surface by Indian embroiderers in gold and silver peacock feather motifs in diminishing size. Once the embroidery was complete on the silk fabric, the pieces were shipped to the incomparable Worth of Paris to be made up into a show-stopping dress (click to see the iconic portrait of Lady Curzon in the Peacock dress). Having admired the tarnished loveliness of this extant gown at the Curzon family seat in Derbyshire many times, and having half-joked for years that one day I'd tackle my own replica of this mind-boggling Holy Grail of historical costume, I began work on my own goldwork Peacock Dress last year. This project will show you exactly how to recreate your own goldworked feather motif, just like the ones on Worth's famous dress. Stretch the two fabrics tightly in a free standing frame with the taffeta on top (for larger pieces, follow this excellent tutorial). Mark out the dimensions of the feather in whatever way you prefer. I simply used a sharp pencil, since my feathers interlock, covering the pencil marks completely, but seasoned goldworkers tend to favour a prick and pounce method. The dimensions of the feather that you see being made here are as shown (right). Make the central vein and outline the eye first. Take a piece of twist approximately 15cm (6") long. Carefully thread about 1cm (or about ½") of the end through the eye of the chenille needle. Insert the point into the fabric at one end of the feather and pull through sharply in order to hide the end of the twist. Using a normal embroidery needle, secure your thread with three tiny backstitches within the boundaries of the feather shape - your stitches will not show through the dense embroidery on top. Bend and sew the end of the twist down through the fabric - again, sew it down within the feather shape, as your stitches will be hidden later. Begin to couch (oversew) the twist down, slightly to one side of the central stem, with stitches at approximately 5mm (3/16") intervals. When you meet the circle indicating the eye of the feather, make your last couching stitch close to the eye and then use a pair of tweezers to squeeze the twist into a sharp point, forming a clean change of direction as you go into the eye. Continue couching around the eye, ensuring that the angle that the twist makes as it bends from the central stem into the eye isn't too sharp. A right angle here will be difficult to wrap the later rows of embroidery around, as you can see in the feather below the one being worked on in the picture! Continue back up the stem, staggering your stitches to fall halfway in between the stitches on the first half of the vein. When you're around two thirds of the way up the stem, insert the end into the fabric as before, using the chenille needle. Complete the couching stitches and secure the end as before, and trim if necessary. Now we'll move on to the fronds of the feather. I find it helpful to draw a few guidelines on the fabric, parallel to the end of the feather, to help me keep the direction of the rows as parallel as I can. They veer off course very easily without guidance! Notice that the mark nearest the eye is reasonably parallel both to the right hand end of the feather and to the rightmost portion of the eye, and that its distance from the eye is about the same as the vertical distance from the eye to the side of the feather. This will be helpful when we're wrapping fronds around the eye evenly. Use the chenille needle again to take the ends of two strands of passing thread through to the back of the work, at the outer corner of the feather. (Thread them both through the needle and insert them together.) With a couple of backstitches, take the couching thread over to the corner of the feather and secure the ends of the passing thread as you did before, with the twist. Couch both strands of passing thread down together, travelling along the edge of the feather towards the central vein, and beginning to curl them around when they meet it. Cut some 5mm (3/16") pieces of bright check with the goldwork scissors. Before pulling the stitch through, bring the needle back up a little way (about 1mm) behind the entry point, underneath where the check will lie, and then pull through. Back to the passing thread now. Continue couching the passing thread down alongside the check. You will notice that the thread helps to hold the "beads" of check in place, in a continuous line. Turn the passing threads back on themselves at the edge of the feather. Use the tweezers again to make a sharp u-turn; holding the thread down with the mellor, a little way from the end, will help make this less fiddly. Continue couching, placing stitches halfway between the stitches on the previous row to create a brickwork-like pattern. At the stem, curve back and make another row of bright check as before. Continue in this way until you reach a point where the embroidery is as far from the eye as the eye is from the side of the feather. Curve the row at the side of the feather and continue down to the end of the feather (right). Then continue as before until you're about halfway around the feather, at which point we'll make the eye. Beetle wings are surprisingly easy to work with. They are a lot like brittle fingernails, and can be cut to shape with a pair of small scissors. If you're using one, cut a portion of beetle wing that's approximately circular and almost half the diameter of the eye shape you've marked out. Don't worry if the shape is not perfect, as the edges will be covered with embroidery, like a jewel held in a setting. Then use a sharp needle and a cork to make two holes in it. Make the holes well inside the wing - it will split easily if pierced too close to the edge. The holes and the stitches holding the wings on are clearly visible on the original dress, and they don't detract from the overall look, so don't worry about trying to make the stitches holding these on tiny or invisible! Couch down another short length of twist inside the eye of the feather, in a little smile shape around three-quarters of the way down from the end of the stem. Don't bother to thread the ends into the fabric. This little piece will form padding for the eye, and will be covered up shortly. Sew the beetle wing (or jewel, if using one) down through the holes you've made, towards the top of the eye but leaving a little space around it. Cut some pieces of bright check slightly shorter than the pieces you were using before. Beginning in the middle, sew these down over the smile, forming a raised section of work. You'll be able to fit around seven pieces in over the smile, working a little way up the sides of the eye. Sew four more pieces around the beetle wing, enclosing the edges like a jewel setting. The eye is now complete. Continue with the fronds, either by continuing on from where you left off, or by beginning again at the other side of the feather. I have found that each way has its advantages and disadvantages. If you carry on from where you left off, it can be difficult to form fronds back towards the right hand side in quite the same way as you did on the way leftwards - the ends near the stem start to look messy. But if you start at the right again and work towards the eye, your embroidery may not meet quite perfectly in the middle. I think the first option works better, with practice, but you'll find your own way. Left, the finished peacock feather: around 3-4 hours' work, and a stunning result. 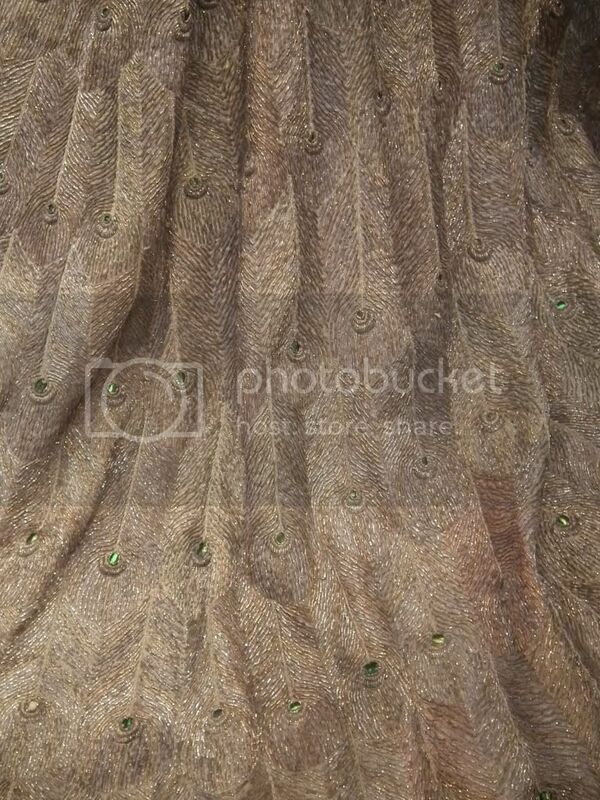 Right, large, tarnished goldwork feathers nearer the hem of the original Peacock dress. Oh. My. God! You are amazing. That's it. Ran out of words. Thank you so much for sharing this glimpse into your project. Wow. This is amazing, and I can't wait to see it in person at Costume College, next year we hope. Utterly amazing, Cathy! If you feel motivated to do some Show and Tell this fall, I'd LOVE to see this up close when I'm in the UK! Thank you ladies! Val, next year is not going to be possible unless I get a team of twenty or more working on it, but I must get more of a website together to show progress! Jennie, I'll have to see if I can get the first panel finished and off the frame by September!